Corflute is one of the great materials used for signage. Its versatility and affordability mean it is first choice for a number of industries and purposes. But what is corflute, and why is it so good? 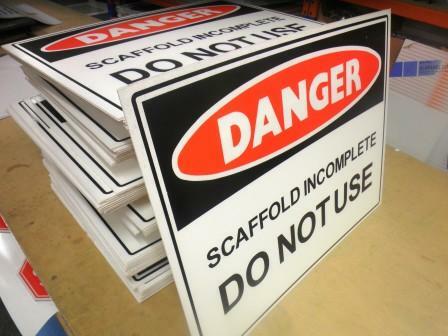 There’s no danger in choosing corflute for your signage needs. Corflute is a trade-marked name for an extruded twin-wall plastic sheet product similar to corrugated fibreboard. At normal temperatures it is impervious to oil, solvents and water, making it perfect for outdoor applications or use in conjunction with harsh chemicals. They are used in construction, real estate and security to advertise, inform and warn. Corflute is affordable and economical, making it preferable to aluminium composites in many applications. Corflute is durable – with its ability to withstand weather and chemicals it can last for many months in the toughest conditions. It is not uncommon to see corflute signs still in use and looking good on outdoor sites many years after their initial installation. Its construction means it can take a physical beating as well, making it an excellent choice for the construction industry. Corflute is adaptable – you can cut a corflute sign to just about any shape using tools as simple as a Stanley knife or as precise as a die. It can also be scored to suit. Corlfute is easily installed – its smooth backing and lightweight means you can adhere it to just about any surface with double-sided tape, screws, or glue. You can also have metal eyelets installed at time of printing to hang signs from fencing or hooks.